thanksgiving | Move Your "..BUT God .."
I never dreamed when I wrote this for our women’s ministry retreat devotional book in 2004 that my life would completely shatter five years later. Ironic, but maybe yet a blessing, that I’ve had to live out the truth of this message. Every broken one of you, here’s the BUT: God says you can be and ARE whole, a beautiful picture patterned after His love and grace and redeeming power. “Rumble, KLUNK, rumble, KLUNK.” The shards of broken colored glass tumbled into ever-changing pattern and I drew in my breath as I excitedly turned the revolving end of the kaleidoscope tube, trusting something beautiful would fall into place as I watched. Decades melted away as I stood in a small booth in the antiques store. This red tube with pictures of swirling six-pointed patterns and the slightly frosty plastic cover over the opening was exactly like the one I cherished fifty years earlier. It was one of my favorite toys then, and I never tired of turning the tube to gaze at the shifting images. Sometimes one of such splendor would tumble into place that I held my breath and my hands steady to capture and drink in the spectacle. So much beauty from bits of glass and happenstance. Odd bits and happenstance: that could be the title for my life, or so I often think. After all, what have I really accomplished so far? Room mother, den leader, Vacation Bible School teacher, wife, mom, occasional substitute teacher . . . a long list of odd bits that don’t seem to mean anything, or to fit together in any coherent way, or to serve any good purpose. Then there are the broken pieces of hopes so long delayed – or never materializing – dreams that took a detour, my own failures, a relationship scarred by a breach of trust, grief from losing my father to the slow death of Alzheimer’s, leaving everything I loved behind in a move across the country . . . How could goodness or purpose come from all that “junk”? Turning the old kaleidoscope over, I examined the pieces of glass at the end: formless, meaningless junk, and not much of it, either. But when I looked through the viewing hole as I rotated the tube, glorious patterns appeared, made from those same broken pieces. What made the difference? It was what I couldn’t see inside the tube. Inside were three long mirrors set in a triangle along the length of the tube. Light coming through that “junk” and reflected off those three mirrors that made pattern, beauty, and glory. A Christian’s life is like a kaleidoscope. Yes, there are broken bits and “junk” that we don’t understand in our lives, but the light of God shining through that “junk” and reflected through the Father, Son, and Spirit brings pattern, beauty and glory from our lives. Insignificant? Teaching Vacation Bible School all those years doesn’t seem to amount to more than countless sock puppets, making clay bricks, and pouring Kool-Aid® . . . but our older son is a missionary. The story of the boy who shared his sack lunch with Jesus to feed 5,000 people has taken on a larger, deeper meaning to me now. Formless? Moving across the country and saying good-bye to family, to friends of twenty years, and to what seemed to be the beginning of a productive new career certainly seemed more painful than purposeful . . . until I connected with a ministry to women dealing with the loss and anxiety of moving. I never would have understood their grief if I hadn’t experienced it myself. Meaningless? That’s what seven long years of repeated hope and disappointment in trying to conceive our second child seemed . . . until I understood that God’s plan wasn’t for just A child, but for this specific child, who wouldn’t have been conceived at any other time. My faith is growing up into trusting God for his best in everything, including a prayer whose answer I’m still waiting and believing I’ll see, now nineteen years after I first lifted it to God. Three mirrors are in my life: Father, Son and Spirit. Granted I don’t hear “Rumble, KLUNK,” as God works in the pieces of my life, and often I have to just trust that beauty and form are there somewhere, but now I realize my life isn’t “happenstance.” In fact, as my life “turns” through the years, I see the same bits coming together to make new and different patterns as God brings new people and avenues of ministry into my life. I know that even the broken pieces and the bits that seem unimportant and disconnected have the potential for beauty, purpose, and glory as I choose to focus through the “viewing end” and see my life reflected through the three-in-one God. Will I one day see an image of such splendor that I catch my breath in wonder? shining through your life create BEAUTY from the broken pieces! A “…BUT…” to pray: God, loving Father, my life is shattered. I see no reason, no pattern, no “why” to ________________________________________________________________________________________ that’s broken _____________________________ in my life. BUT today I hand you the broken pieces, to reflect Your beauty, pattern, and indescribable love. I will trust you to create something beautiful fromtjese broken pieces, and Holy Spirit, speak to me as I listen to Your voice, to hear the truth of who I am in You still ____________________________________________________________________________ Use this, Almighty God, for YOUR glory! May His love make you whole! God is NOT a good idea! God is not a good idea. I took that thought apart when I helped Dr. Walt Kallestad write a book on understanding the basics of Christian faith. If God were simply an idea, a mental construct, a convenient way of thinking to explain the Universe or the sense of moral order, right and wrong, that exists in most people –at least the emotionally and mentally healthy – then we’re all in big trouble. I think of how many “good ideas” I’ve had that failed, but more terrifying, I think of the “good ideas” men have had over history that have wiped out entire villages and decimated nations. No, if God is only a mental abstraction, then there is no help or hope for any of us, no existence beyond seven or eight decades of getting up every morning, raising children or going to a job, to what end? I vividly remember taking a shower one Saturday night when I was seventeen, when the thought of a universe without God struck me. The bleak emptiness and total senselessness of a universe, a dark lifeless vacuum, void of God sank me to my knees on the wet tile, my head in my hands. The moment of terror passed, and the next morning I was singing in the choir about the great love that’s ours in Jesus. I worshiped, reaching in my heart with thanks and gratitude that God is very much alive, real, and a Being of indescribable power, love, creative splendor and intimate relationship far beyond any “thing” I can imagine! We were Methodists, of the traditional John Wesley “heart strangely warmed” variety who acknowledged God’s Spirit as a very real and immanent, personal presence in our lives. Perhaps my love of worship stems from the fact I was born, after a long labor, late on a Sunday morning. My father rang the bell in the steeple of the church in our tiny town every Sunday morning, and that January 22, after a tedious night with my mom in the hospital in the County Seat quite a few miles away, Dad drove back to church, rang the bell, then drove back to the hospital in time for my long-awaited debut. I recall some of the very traditional liturgy, or form/pattern/ingredients of worship, I grew up hearing in the services every Sunday with a grateful heart that somehow the Responsive Readings, Apostle’s Creed, Lord’s Prayer, and weekly singing of the Gloria Patri (“Glory be to the Father, and to the Son and to the Holy Ghost…”) after the Bible reading and the Doxology (“Praise God from whom all blessings flow”) after the offering never became mindless repetition to me. 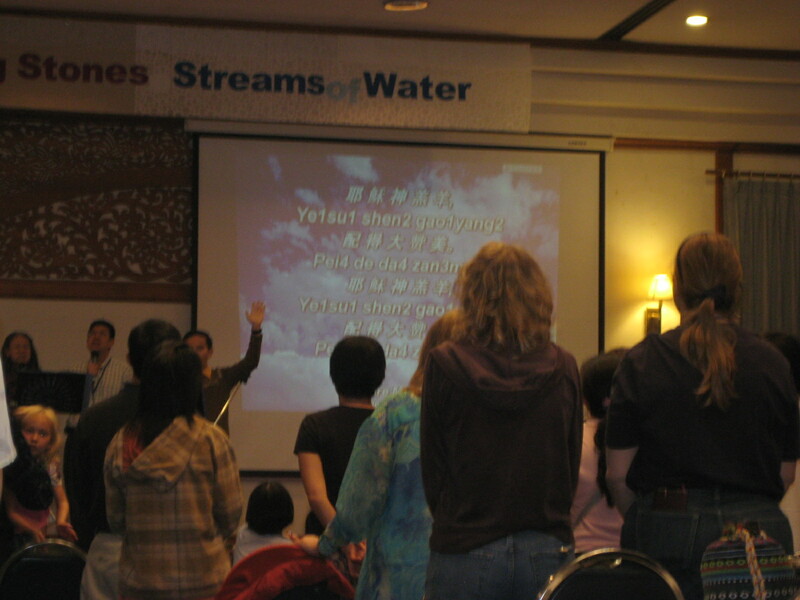 In fact, I look back on those elements of worship with a warm glow in my heart and do miss them in the Sunday services of the non-denominational church I attend now, where lively and deep praise songs take center stage in worship. I miss them, but I don’t worship them. I don’t worship the old structure, but at the same time I don’t worship the absence of the ”traditional” structure and presence of “tradition-free” services. I agree with the comment I heard one Sunday that the only difference between a rut and a grave is how far down you dig. God never meant real worship to be a rut or a grave, mindless and heartless routine completing a required ritual, like checking off boxes on a to-do list. I strongly suspect God created worship as a vehicle to carry us right into God’s love for us, the Holy of Holies itself: God’s heart. In true worship my heart meets His and becomes the room, the space for the Holy of Holies. How can I bring an angry, judgmental,selfish thought into That Presence? I enter the Holy of Holies;I enter through the blood of the Lamb. I Enter to worship you only; I enter to honor I AM. Instruments or voice only? Sitting or standing, arms raised or decorously in laps? Oh, please, what’s the difference, if truly loving hearts are encountering the fiery heart of God and praising his love for them? Enjoy the beauty, forget condemnation, and see the splendor in the Lord, not the “faults” in each other’s styles and forms! I need moments of silent, wordless reverent awed awareness down on my knees, and I need the exultation of laughing and dancing in the midst of unconditional love. Worship isn’t about what or how; it’s about Whom! I don’t worship a form, style, tradition, or experience; I invite God into my life by running into his presence to be lifted and honored and revered and enjoyed. God inhabits, lives in, the praises of His people, and yes, I dance right in the ”pew’ when I feel overjoyed by my Father God’s love for me. Look away if love disturbs you, or join me in a happy dance if you don’t care what anyone but your Daddy thinks. Worship in its truest and most satisfying is real heart-felt, in the present and Presence praise, recognizing God is God and we are not, God is good, God is real, alive, personal as well as holy, God is here wherever here is, approachable as well as completely lofty and apart, and wants intimate relationship with us, with ME, with YOU! Whether I worship in my own house, worship while I walk the dogs, or worship in a church with others, it’s healing, comforting, depression-countering, en-couraging, and powerful as a weapon of spiritual warfare. I don’t cling to tradition and disdain contemporary, but I don’t disdain tradition as irrelevant. There is beauty to find in it all, every expression because our God is beautiful. Hearts sang with passion when Isaac Watts’ “Joy to the World” erupted as radical praise and worship in 1719, and we feel that when we sing it today. I find such freedom in worship, such delight in connecting with God and praising, even when I attend a different church or different denomination. In one church I loved being part of, the arts school affiliated with the church regularly brought dancers, singers, artists and even aerialists to add beauty, awe, wonder, joy and life to our worship. I keep my hands at a respectable height yet raised about mid-body in more conservative churches, raise them high in others, kneel on kneelers in some fellowships, kneel right on the floor in the row of chairs in others when I feel the weight of God’s holiness and goodness, repeat the written prayer along with the priest or pastor and everybody in some churches and offer up my own words along with everyone else after a particularly moving “7-11” contemporary song in others, seven words sung eleven times and nobody gets tired of singing! Our family spent two months in Beijing, China in 1984, and “church” there meant meeting with Christians from literally all over the world in one of the embassies. The International Fellowship had no pastor that summer, so individuals from the congregation took turns leading worship and giving a message. If one of the Africans was preaching, you could count on being there for two hours. If a European or American spoke, we were likely to be out sharing lunch within an hour. What fun to meet and enjoy being God’s kids together, singing songs that might be unfamiliar, praying silently or out loud, in unison or each in our own words, but recognizing and drawing close to the same Lord, Father, Savior. The truth is that I don’t worship God because I’m required to, or because a narcissistic God demands praise and worship. Honestly, I worship God because I NEED to! I need to connect with the reality and person of God, to encounter His love for me as I reach toward him, some days to dance ”in His arms,” some days curled up in His lap in my wing chair, some days with my feet splashing in a stream, some days flat on my face on the floor in my bedroom, but as often as I can in the company of other Christ Followers, whatever their denomination, tradition, or “flavor,” in the power and joy and reverence of our combined love, gratitude, and communal vision and passionate purposes before our mutual Father God. To You belongs silence [the submissive wonder of reverence], and [it bursts into] praise in Zion, O God; And to You the vow shall be performed. I’m reposting this from four years ago, on another Palm Sunday, because I need the reminder and you may, too, so that we don’t take Jesus’ sacrifice and this Holy Week for granted or make it less than the monumental move of God’s incomprehensibly great mercy, grace and untiring love that it was and will always be. That Almighty God not only puts up with us, but gave Himself bring us back into living relationship with him through the costliest offering ever made makes me fall on my face again, just as I did in the teachers’ workroom where I came upon Vy Canis Majoris and it threw me to the floor, and then in my living room where this thought exploded in me four years ago and put me on my face in totally sold out wonder and gratitude. I admit fear of man threw me off track a month after this, but I come again to look to the ONE who’s kept me in the last four years despite my stumbling. THAT is the unmerited merciful GRACE OF GOD! The latest one that grazed my consciousness on Palm Sunday, March 24th, entered the orbit of my subconscious during the week before as I searched YouTube for some exciting video and information about relative sizes of objects in space for the third grade class I assist in. Some facts about VY Canis Majoris absolutely astounded me: a red hypergiant, it’s one of the largest stars we know of, with a diameter of 1,227,000,000 miles (that’s billion, if you don’t want to count the place value yourself), or 1,975,000,000 kilometers. I sat in bed at 5 a.m. that Sunday and tried to cold-start praise to the King of Kings as Holy Week began. A realization rose slightly above the horizon of my consciousness: WHOSE blood bought me? WHOSE blood? Yes, Jesus’ blood – that rolls of my tongue almost tritely sometimes – but WHAT blood is his? The “gestalt” of VY Canis Major fused with these Bible verses and blazed into a whole much bigger than the sum of its parts. The Blood that bled for every speck of sin in my life coursed through the veins of THE ONE whose voice spoke the inferno of VY Canis Majoris into existence. THAT blood! The most precious fluid and outrageous gift in the universe because it was the Blood of the ONE who imagined, then spoke blood itself into being and who bound the vastness of himself within the confines of a completely human body to spill HIS blood instead of requiring mine. And HE, PURE LOVE, PURE RIGHTEOUSNESS, PURE HOLINESS, PURE LORD OF ALL CREATION, willingly gave it for me. Even now I feel like I’m writing an ionic plasma breath of truth with hands and understanding of concrete, but O God, let me burn with that reality one day! Brand my heart with it now: I AM YOURS! YOU SOUGHT ME AND BOUGHT ME! I WORSHIP, ADORE, PRAISE AND LOVE YOU!